Core Data fetch requests. Web service fetch request, saved to Core Data store. Before working more with Core Data, we will briefly review how to design and write a custom class that describes a real-world object. We should note that small and simple object graphs can be persisted in a plist, “property list”. However, this kind of storage is perhaps more suited to, for example, configuration settings, and is usually inadequate for persisting the app’s data. When you have related objects, do NOT use a plist. 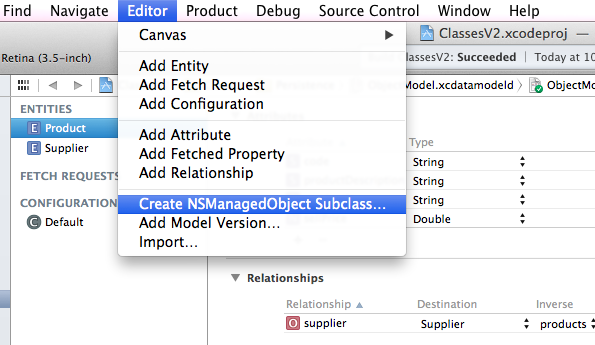 In the course code examples, you will see a project named ClassesV2. The Readme.txt file in the ClassesV2 project helps you do this. Oh, and it also has a WebServiceRequest class, which we will use soon. The data format of the store file is private, and is NOT important to us. We repeat, it is NOT important to us. Understood? The CanadaAdd code example (in the GitHub repository) is a good example of an app that works with one entity. What if you want to add new items to your app? How is this done? Using the add/edit item pattern. A central feature of this pattern is the modal view concept. Use a modal view when you need to offer the ability to accomplish a self-contained task related to your app’s primary function. A modal view is especially appropriate for a multistep subtask that requires UI elements that don’t belong in the main app UI all the time. A protocol is a source code module that declares properties and methods for a task. Then, a class in your app can ‘adopt’ the protocol, and provide an implementation for the protocol’s members. You can follow along by studying the “CanadaAdd” code example. It implements the “add item” pattern. You can also watch these videos, which cover the same content. Add a new controller. It will be a subclass of UIViewController. In the code example, the controller name is “ProvinceEdit”. Edit the ProvinceEdit controller’s source code file. Next, define a “delegate” property for the controller class. 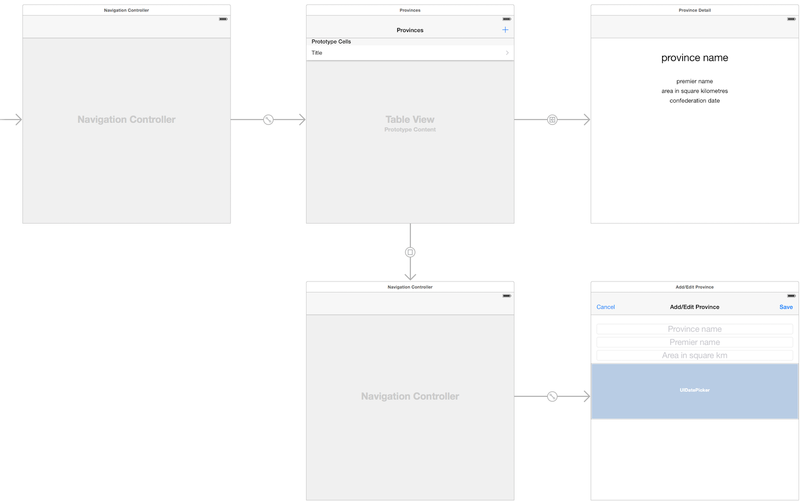 On the storyboard, add a new View Controller scene from the object library. On the Editor menu, embed it in a navigation controller. On the Identity inspector, set its Custom Class property to be the just-added ProvinceEdit class. 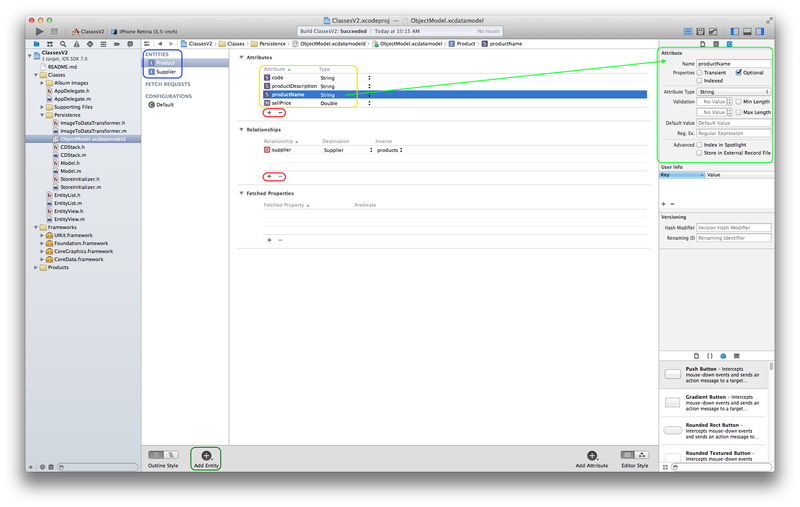 Also, in the “Identity” section (just below the Custom Class section), enter a string for the “Storyboard ID”. A suggested name is “AddEditProvince”. Set the scene’s nav bar title. Add two ‘bar button item’ controls – one for ‘Cancel’ (left side), and the other for ‘Save’ (right side). As you have done before, alternate your work between the scene and controller code to build the user interface, and handle events. Add outlets, and actions for ‘cancel’ and ‘save’. In the ‘cancel’ method, we simply call back into the delegate method, and pass nil as an object. In the ‘save’ method, your code will package the user input, and call the delegate method, passing along the user input package. You can decide on the packaging format. If you have a single string or number item, just send that along. If you have multiple items to send, package them into an NSDictionary and/or an NSArray object. In this situation, package it into a new ‘Province’ object. In the presenting controller’s declaration, adopt the new ‘add item’ protocol. Add a method (defined by NSFetchedResultsControllerDelegate) that will respond to changes in the ‘fetchedObjects’ result set. The method is controllerDidChangeContent(). Then, implement the delegate method(s). Finally, dismiss the ‘add item’ controller. A fetched results controller object is used with a table view. If you are not using a table view, how do you query the on-device data store? With a fetch request object. Previously, you have learned that a fetched results controller includes a fetch request property. You can use a fetch request object to perform a get-all, get-some-filtered, or get-one query. For all of these situations, the results come back as an array that has zero or more objects. A get-all query will not need a predicate. A get-some-filtered or get-one query will need a predicate. Predicate string format examples are fully documented here (although some will not work with a Core Data store). For any query that will return a collection, you can choose to configure sort behaviour, if you wish. Follow this guidance to code your first standalone fetch request. In this scenario, we are fetching a ‘Sport’ object that’s in the Winter 2015 programming Assignment 1. We are using a get-one predicate, so the fetched results will be an array with exactly one object in it. Next, ask yourself whether you need a predicate, or sorting. One of the tasks in the winter-term Assignment 1 is to fetch data from a web service, and save the data on the device. Today’s code example, Toronto2015, is in the GitHub code repository. Download it, study it, and use some of its code and principles to enable you to add functionality to your app. Your professor will guide you through the topic. The code example is fully-commented, and lengthy, mostly because of the comments. 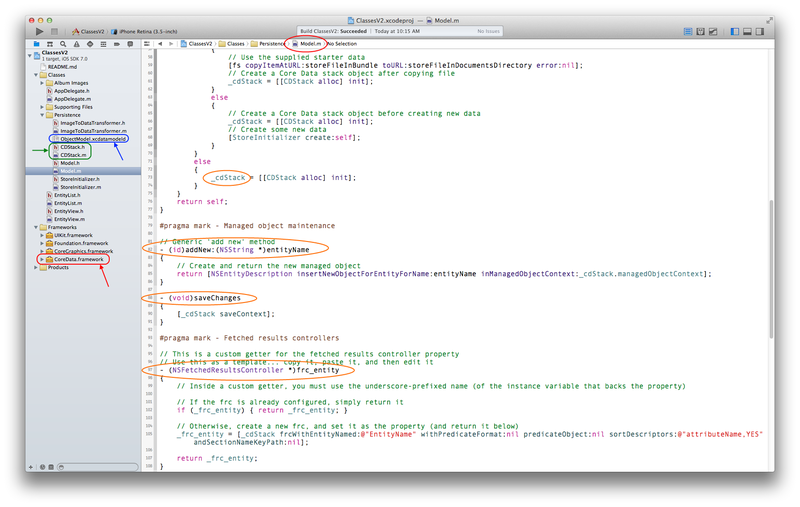 Most of the logic is in the ‘launch’ controller, in the Launch.swift source code file. It relies on functionality in the Model class, and in a new ‘extension’ that’s in the Extensions.swift source code file. Learn more about extensions in the Swift Programming Guide section. What is the coding plan? 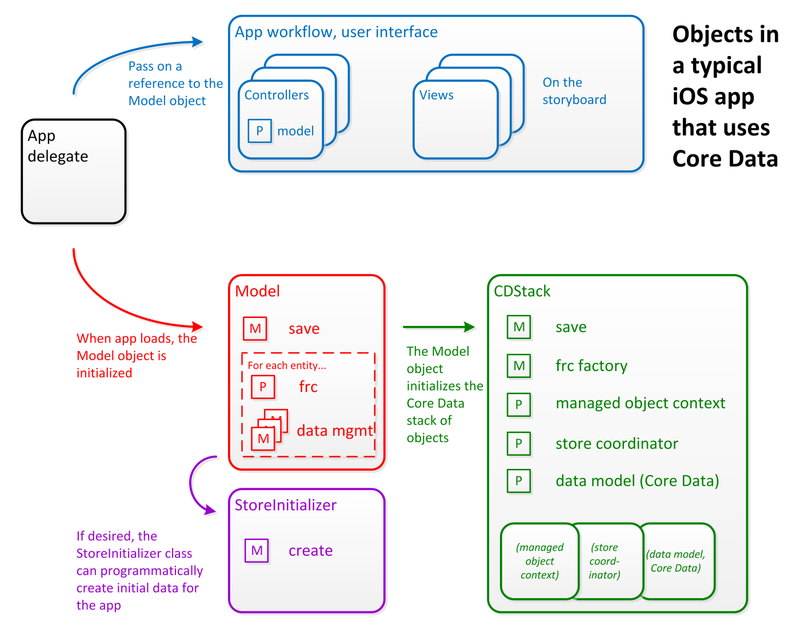 In the launch controller, check if the data store has any objects in it. If not, then register for a ‘fetch sports’ notification. Then send a request for ‘sports’ to the web service, and wait for the results. When the response comes back, it calls the ‘fetch sports completed’ method. Next, register for a ‘fetch venues’ notification. Send a request for ‘venues’ to the web service, and wait. When the response comes back, it calls the ‘fetch venues completed’ method. At this point, you have the data. Add ‘sport’ objects to the device store, in a loop. Then, add ‘venue’ objects to the device store, in a loop. While adding each ‘venue’ object, must set the relation to the ‘sport’ object(s).